The “Gilded Age” refers to the period following Reconstruction, when the American economy grew at its fastest rate in history. The period after Reconstruction, the last few decades of the nineteenth century, was known as the ” Gilded Age,” a term coined by Mark Twain in 1873. The Gilded Age was a period of transformation in the economy, technology, government, and social customs of America. This transformation forged a modern, national industrial society out of what had been small regional communities. Many new corporations and businesses gave rise to ultra-rich individuals. The period also was marked by social movements for reform, the creation of machine politics, and continued mass immigration. During the Gilded Age, the wealthy provided private money to endow thousands of colleges, hospitals, museums, academies, schools, opera houses, public libraries, symphony orchestras, and charities. This period also is referred to as the “nadir of American race relations,” a time when racism in the country is deemed to have been worse than in any other period after the American Civil War. robber baron: Especially in the nineteenth century and early twentieth centuries, a business tycoon who had great wealth and influence but whose methods were morally questionable. Gospel of Wealth: An article written by Andrew Carnegie that describes the responsibility of the new upper class of self-made rich to engage in philanthropy. Machine Politics: In U.S. politics, a party organization, headed by a single boss or small autocratic group, that commands enough votes to maintain political and administrative control of a city, county, or state. Second Industrial Revolution: Also known as the “Technological Revolution,” this phase lasted from the 1860s until World War I. It began with the innovation of Bessemer steel and culminated in mass production and the production line. The period in United States history following the Civil War and Reconstruction, lasting from the late 1860s to 1896, is referred to as the “Gilded Age.” This term was coined by Mark Twain and Charles Dudley Warner in their book The Gilded Age: A Tale of Today, published in 1873. The term refers to the gilding of a cheaper metal with a thin layer of gold. Many critics complained that the era was marked by ostentatious display, crass manners, corruption, and shoddy ethics. Historians view the Gilded Age as a period of rapid economic, technological, political, and social transformation. This transformation forged a modern, national industrial society out of what had been small regional communities. By the end of the Gilded Age, the United States was at the top end of the world’s leading industrial nations. In the Progressive Era that followed the Gilded Age, the United States became a world power. In the process, there was much dislocation, including the destruction of the Plains Indians, hardening discrimination against African Americans, and environmental degradation. Two extended nationwide economic depressions followed the Panic of 1873 and the Panic of 1893. The Gilded Age saw impressive economic growth and the unprecedented expansion of major cities. Chicago’s population increased tenfold from 1870 to 1900, for example. Technological innovations of the time included the telephone, skyscraper, refrigerator, car, linotype machine, electric lightbulb, typewriter, and electric motor, as well as advances in chromolithography, steel production, and many other industries. These inventions provided the bases for modern consumerism and industrial productivity. During the 1870s and 1880s, the U.S. economy rose at the fastest rate in its history, with real wages, wealth, GDP, and capital formation all increasing rapidly. By the beginning of the twentieth century, per capita income and industrial production in the United States led the world, with per capita incomes double those of Germany or France, and 50 percent higher than those of Britain. The businessmen of the Second Industrial Revolution created industrial towns and cities in the Northeast with new factories, and hired an ethnically diverse industrial working class, many of them new immigrants from Europe. The corporation became the dominant form of business organization, and a managerial revolution transformed business operations. The super-rich industrialists and financiers such as John D. Rockefeller, Andrew W. Mellon, Andrew Carnegie, Henry Flagler, Henry H. Rogers, J. P. Morgan, Cornelius Vanderbilt of the Vanderbilt family, and the prominent Astor family were labeled as “robber barons” by the public, who felt they cheated to get their money and lorded it over the common people. Their admirers argued that they were “captains of industry” who built the core America industrial economy and also the nonprofit sector through acts of philanthropy. For instance, Andrew Carnegie donated more than 90 percent of his fortune and said that philanthropy was an upper-class duty—the “Gospel of Wealth.” Private money endowed thousands of colleges, hospitals, museums, academies, schools, opera houses, public libraries, and charities. John D. Rockefeller donated more than $500 million to various charities, slightly more than half his entire net worth. Nevertheless, many business leaders were influenced by Herbert Spencer ‘s theory of Social Darwinism, which justified laissez-faire capitalism, ruthless competition, and social stratification. Gilded Age politics, called the “Third Party System,” featured very close contests between the Republicans and Democrats (with occasional third-party political campaigns by farmers and labor unions), civil service reform, organized movements that enlisted many women working for prohibition and women’s suffrage, the strengthening of big city machines, and the transition from party to modern interest-group politics. Nearly all of the eligible men were political partisans, and voter turnout often exceeded 90 percent in some states. The dominant issues were cultural (especially regarding prohibition, education, and ethnic or racial groups), and economic (tariffs and money supply). With the rapid growth of cities, political machines increasingly took control of urban politics. Unions crusaded for the eight-hour working day and the abolition of child labor; middle class reformers demanded civil service reform, prohibition, and women’s suffrage. Socially, the period was marked by large-scale immigration from Germany and Scandinavia to the industrial centers and to western farmlands, the deepening of religious organizations, the rapid growth of high schools, and the emergence of a managerial and professional middle class. In terms of immigration, after 1880, the old immigration of Germans, British, Irish, and Scandinavians slackened. The United States was producing large numbers of new unskilled jobs every year, and to fill them came individuals from Italy, Poland, Austria, Hungary, Russia, Greece and other points in southern and central Europe, as well as from French Canada. The “nadir of American race relations” is a phrase that refers to the period in U.S. history from the end of Reconstruction through the early twentieth century, when racism in the country is deemed to have been worse than in any other period after the American Civil War. During this period, African Americans lost many civil rights gained during Reconstruction. Anti-black violence, lynchings, segregation, legal racial discrimination, and expressions of white supremacy increased. Conservative, white Democratic governments in the South passed Jim Crow legislation, creating a system of legal racial segregation in public and private facilities. Blacks were separated in schools and hospitals, and had to use separate sections in some restaurants and public transportation systems. They often were barred from certain stores, or forbidden to use lunchrooms, restrooms, and fitting rooms. Because they could not vote, they could not serve on juries, which meant they had little if any legal recourse in the system. Blacks who were economically successful faced reprisals or sanctions. Through violence and legal restrictions, whites often prevented blacks from working as common laborers, much less as skilled artisans or in the professions. Under such conditions, even the most ambitious and talented black people found it extremely difficult to advance. The end of the Gilded Age coincided with the Panic of 1893, a deep depression, which lasted until 1897 and marked a major political realignment in the election of 1896. This productive but divisive era was followed by the Progressive Era. 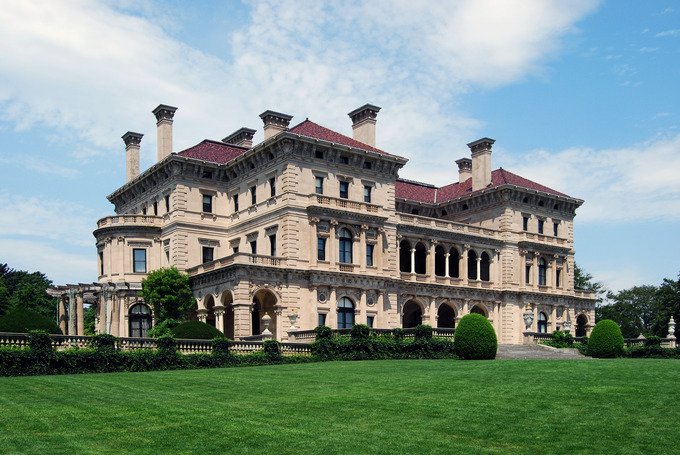 The Breakers: The Breakers, the summer home of Cornelius Vanderbilt II, located in Newport, Rhode Island, United States. Built in 1893, it typifies the excesses of Gilded Age wealth.